Figure 1. Meteor Crater, AZ. Figure 2. ASTER VNIR false color. Figure 3. TIMS end-member false color. Figure 4. 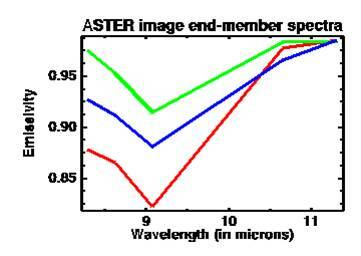 ASTER image end-member spectra. Figure 5. ASTER end-member analyses. With an abundance of thermal infrared (TIR) data expected from the Thermal Emission Imaging System (THEMIS), a knowledge of the constraints of the instruments' spatial and spectral resolution is required for an accurate interpretation of the surface composition of Mars. The Earth-orbiting Advanced Spaceborne Thermal Emission and Reflection Radiometer (ASTER) provides a proxy for THEMIS due to the similar spatial and spectral resolution of the two instruments. 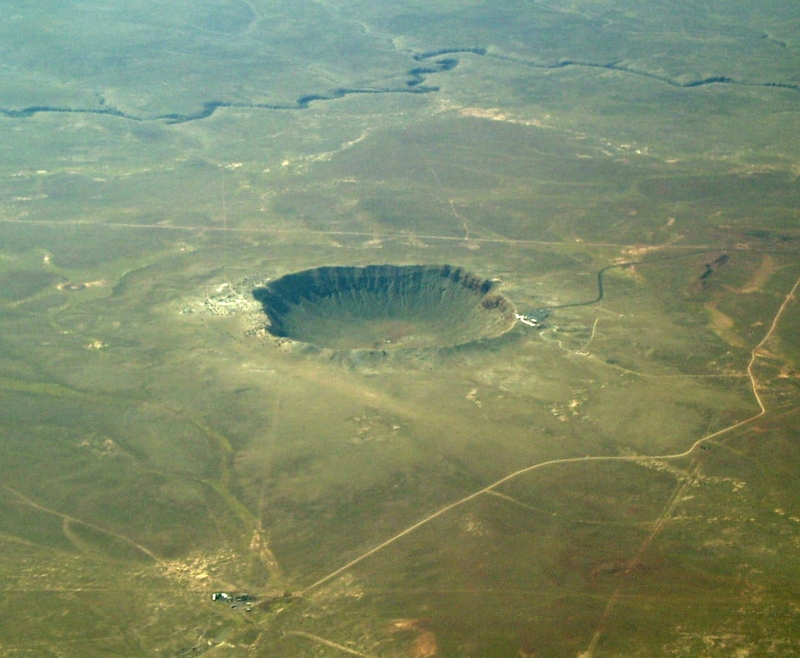 Meteor Crater, Arizona is located in semi-arid, north-central Arizona and is one of the most recent and well-preserved impact sites on Earth (Fig. 1). The simple, bowl-shaped crater is 180 meters deep and 1.2 km in diameter with an eroded rim standing 30-60 m high. The local geology consists of three flat-lying sedimentary members with well-documented lithologies and contrasting spectral signatures. The arid climate and lack of vegetation make Meteor Crater an excellent site for thermal infrared analyses and a logical choice to be an analog for similar-sized impact sites on Mars. There are over 43,000 impact craters on the surface of Mars with diameters greater than 5 km [Barlow, 2000]. Small impacts outnumber larger ones on planetary surfaces, and the freshest craters should be of younger age. Estimates are that there are over a quarter of a million impact craters on Mars that are similar in size to Meteor Crater. The youngest of these should have a pristine ejecta blanket and have not been present long enough for a significant amount of dust to accumulate. Small particles sizes such as dust can effect the interpretation of thermal infrared spectra due to scattering properties. 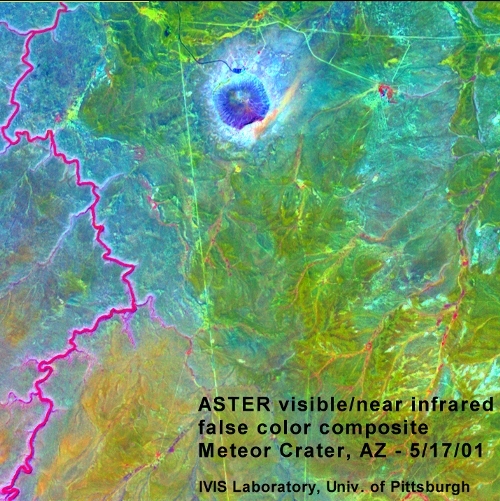 ASTER is a multispectral imager on the Terra spacecraft and is part of NASA's Earth Observing System. It has been operational since October 2000 and has collected seven images of Meteor Crater, Arizona (Fig. 2) ASTER has fourteen bands from the visible to the thermal wavelengths, including five in the TIR at 90 meter spatial resolution and three bands in the VNIR at 15 meter spatial resolution. 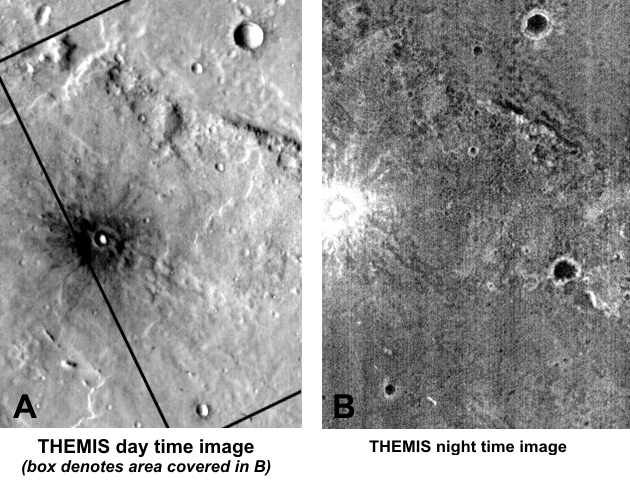 THEMIS, a multispectral imager on the Mars Odyssey orbiter, has returned images in the VNIR and TIR wavelengths since February 2002. The primary objectives and science goals of THEMIS are to determine the mineralogy and petrology of the surface of Mars utilizing the hyperspectral data of the Mars Global Surveyor (MGS) Thermal Emission Spectrometer (TES) in order to study small-scale geologic processes and potential future landing sites [Christensen et al., 2002]. THEMIS has ten TIR bands from 6.5 mm to 15.5 mm at 100 meter spatial resolution. The atmosphere of Mars is opaque over Band 10, which contains a band center at 14.88 mm, so no information can be returned concerning the surface over this bandwidth. THEMIS also has five bands in the VNIR at 18 meter spatial resolution. ASTER thermal infrared images were converted to emissivity and deconvolved with image end-members and sample end-members. Both analyses were compared with each other and to an earlier high-resolution TIMS image analysis (Fig. 3) [Ramsey, 2002]. A few notable points of interest that were examined in each image include the distribution of ejecta, lithologic mixing within pixels, and the extent and composition of the crater's northeastern windstreak. Image end-member analysis: Using image processing software, image end-members are chosen and an image end-member deconvolution was performed. Image end-member spectra are shown in (Fig. 4) and the image end-member analysis is shown as (Fig. 5). The same color scheme is used for the spectral plot and image (i.e., the red pixels on the image correspond to the red image end-member). Sample end-member analysis: Samples of the lithologies at Meteor Crater were collected and emission spectra was obtained for each with a Nicolet 670 Spectrometer. Sample emission spectra were filter functioned to ASTER TIR wavelengths to simulate how the spaceborne instrument would observe the lithologies. An ASTER lithologic end-member library was created with these filtered spectra. Sample end-member spectra analysis are shown as (Fig. 5). Note that the image end-member analysis compares better to an earlier high-resolution TIMS image end-member analysis (Fig. 3) of the distribution of the Meteor Crater ejected lithologies than the sample end-member analysis [Ramsey, 2002]. This is a potential drawback where deconvolving multispectral data with 90 - 100 meter pixels. The effects of using laboratory mineral spectral libraries as end-members with multispectral spaceborne data should be investigated and understood. The resolution degradation from 10 mm in the spectrometer to the 100 m spatial resolution of the spaceborne THEMIS instrument must be accounted for. Searches for and analyses of fresh impact craters in the high-albedo ("dusty") regions of Mars are currently being performed. As seen by the differences of the daytime and nighttime temperatures of fresh impact craters on Mars (Fig. 6), the rims and ejecta blankets of fresh impacts consist of materials with a higher thermal inertia than the surrounding plain. This suggests a "rocky" ejecta blanket with less dust. It has been seen that impacts are probes into planetary surfaces, expose underlying lithologies, and are relatively dust free. Where dust mantles the surrounding plain and makes deconvolutions of thermal infrared spectra difficult, the rims and ejecta blankets of fresh impact craters consists of larger particle sizes that are ideal for thermal infrared analyses. The thermal infrared spectra of larger-than-dust particle sizes such as sand, cobbles, and boulders has been shown to be linearly interpretable [Ramsey and Christensen, 1998]. Ramsey, M.S., Ejecta distribution patterns at Meteor Crater, Arizona: On the applicability of lithologic end-member deconvolution for spaceborne thermal infrared data of Earth and Mars, J. Geophys. Res., 107(E8), DOI: 10.1029/2001JE001827, 2002. Ramsey, M.S. and P.R. 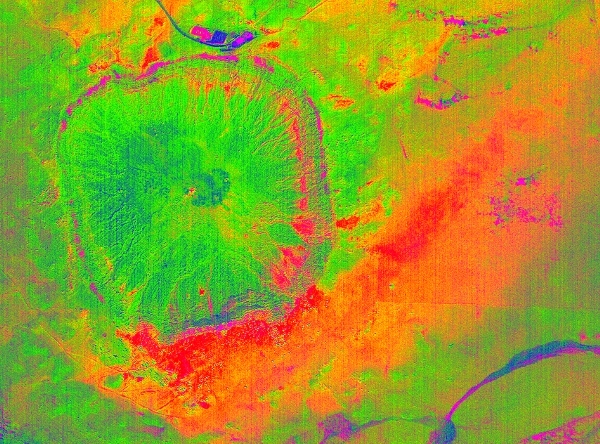 Christensen, Ejecta patterns of Meteor Crater, Arizona derived from the linear un-mixing of TIMS data and laboratory thermal emission spectra, in Sum. of the Third Ann. Airborne Geosci. Workshop, vol. 2, TIMS Workshop, edited by E.A. Abbott, JPL Publ. 92-14, pp. 34-36, 1992. Ramsey, M.S., Using terrestrial multispectral images as a proxy for constraining new thermal infrared data of Mars, in Proc. of the Mars Infrared Spectroscopy Workshop, 2016.pdf, Lunar & Planetary Institute, 2002. Wright, S.P. and M.S. Ramsey, End-member analyses of spaceborne thermal infrared data of Meteor Crater, AZ and application to future Mars data sets (extended abstract), Solar System Remote. Sensing Symposium, LPI Contribution 1129, 2002. Wright, S.P. and M.S. Ramsey, Spaceborne thermal infrared data analysis of Meteor Crater, Arizona: Analog for THEMIS data of a small impact crater in Syrtis Major, Lunar and Planetary Science Conference XXXIV, 1495.pdf, 2003.